Racer Back Top "To Matisse with Love"
Racer Back Top "Cherokee Flowers"
These unique Colorful Tankini Tops (can be used as a top or a Swim Top as well). They are bright in color and in design, created from original artwork by the Artist & Designer Jane Vallejo and you can pair them with the matching Palazzo Pants, Skirts, Maxi Skirts too in order to create a beautiful and amazing outfit! Wash in cold water, machine wash, hang dry. 90% Lycra and 10% Spandex. Includes removable bra padding. Runs one size smaller so, be sure to order one size bigger. Tankini Top-"To Matisse with Love"
This fun and very attractive top is great to dress up the matching Palazzo Pants or skirts. You can wear it with white shorts or blue jeans too to look stylish! Made of 90% Polyester and 10% Spandex. Care Instructions: Cold water machine wash, hang to dry. 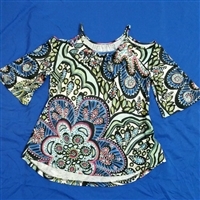 This beautiful top is made with 90% cotton and 10% spandex. It fits beautifully on, and it fits a tiny bigger so order one size smaller. Machine washable in cold water, hand dry. Amazing vibrant colors! If this item is in stock, we will ship out immediately otherwise, it takes 2 to 3 weeks to make item and we will ship as soon as it is created for you. This lovely Cold Shoulder Top is made with Lycra, Cotton and Polyester. This fabric is very soft to wear with the matching Palazzo pants, or with a Matching Maxi Skirt or short skirt...even with white shorts and or, Jeans! If in stock, this item ships out on the next day. Otherwise, it takes 3 weeks to make and then it ships out to you. Cold Shoulder Bell Sleeve Top-"Matisse with Love"
This beautiful top is made of 90% Cotton and 10% Spandex. Can be worn beautifully with the matching Palazzo Pants for a great fashion look that everyone will love on you! Care Instructions: Great traveling fashion because it will not wrinkle, shrink nor fade! Cold water machine wash, hang to dry. Raglan 3/4 sleeve Top-"Groovy Kind of Love"
This lovely long sleeve T-Shirt is made with 90% Cotton / 10% Spandex. The sizes run "one size smaller" so when ordering...order one size bigger. We do make these in larger sizes if needed, just email us or call us and we can place a special order in for your size. Care of garment: Machine wash in cold water, hand dry. If in stock, it will ship out next day. Otherwise it takes 3 weeks to make for you. Raglan 3/4 sleeve Top-"To Matisse with Love"
This beautiful Raglan top is made of 90% Cotton and 10% Spandex. Can be worn beautifully with the matching Pleated skirt or matching Palazzo Pants for a great fashion look that everyone will love on you! Care Instructions: Great traveling fashion because it will not wrinkle, shrink nor fade! Cold water machine wash, hang to dry. If this is in stock, it will ship out on the next day. Long Sleeve Cardigan - "Color Me Beautiful"
This lovely long sleeve lightweight Cardigan Sweater is made with 90% Cotton / 10% Spandex. The sizes run "one size smaller" so when ordering...order one size bigger. 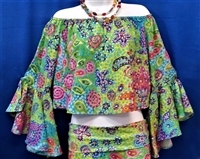 Can be work with matching Palazzo Pants while wearing a white tank or a solid colored top. Care of garment: Machine wash in cold water, hand dry. If in stock, it will ship out next day. Otherwise it takes 3 weeks to make for you.